With the number of connections in the world today estimated to be over 6 billion, USB is by far the most common computer interface with many devices such as keyboards, printers and digital cameras using it as standard. As the number of USB devices has grown the need to easily access them has also increased. This has meant many users now need to expand and extend the USB connectivity of their laptop or desktop computer. Expanding allows devices to be shared, split and accessed by more than one computer or enables a computer to connect to multiple USB devices at the same time. Expanding overcomes the problems of the limited number of USB ports often supplied with modern computers, especially smaller laptops and netbooks. Extending increases the distance USB signals can be sent so a computer doesn't have to be closely situated to the peripheral. This combats one of USB's major limitations in that the standard maximum recommend length for USB cables is 5m due to performance restrictions. However, for some applications for example interactive whiteboard installations, 5m is not always enough so the signals need to be extended. The most common method of expanding USB is through the use of simple USB hubs. Hubs allow multiple USB peripherals to be connected to one USB port. Hubs in turn connect to a host computer transmitting all connecting signals to it. The problem of port congestion is then solved as hubs generally have anything from 2 to 8 ports. Hubs are commonly free standing but are also built into devices such as monitors. USB switches expand peripheral connectivity by allowing them to be shared with multiple computers. They are a cost effective solution especially useful for devices which need to be accessed by more than one computer, such as printers. They eliminate the need for duplicate devices and multiple cables. Switches alternate between computers as the users decide who has access to the equipment at that particular time. 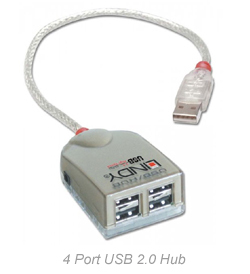 USB sharing hubs combine the functionality of both a hub and a switch and can serve multiple USB devices between a number of computers at the same time. Just like switches, sharing hubs are ideal for larger, more expensive equipment that needs to be accessed by more than one person at a time, but with the capability that allows users to do this simultaneously. As with expanding, extending USB can also be achieved using a number of methods. A simple way of extending USB is by using extension cables. USB extension cables are useful for extending devices over shorter distances and typically max out at around 3m in length. An alternative to standard 'passive' USB extension cables is a USB Active Extension cable. This cable features built-in electronics which regenerate the USB signal to support distances of 5m. Indeed, you can even daisy-chain several active extension cables together to achieve maximum distances of up to 25m. The 'plug and play' capability of all extension cables makes them a simple and easy to use solution. They work with both smaller and larger devices such as card readers and printers. USB extension cables are ideal for use with wireless dongles or with products that have built-in USB cables. A simple, cost effective way to extend USB over very long distances is by using Cat.5 USB Extenders. As their name implies, these devices use standard Cat.5 Ethernet patch cable to make the long distance connection. A transmitter is connected to a computer via its USB port while a receiver connects to the USB peripheral at the opposite end. The two units are then connected using Cat.5/6 cable. Perhaps the ultimate form of USB extension is the USB over IP server which allows USB devices to be connected to a network. Equipment such as a standard USB printer can be transformed into a shared network device as the server provides an interface between the device and a network. It simply connects the device to a network via Ethernet so the device can be used by anyone on the network wherever they are in the world!